I donated to the Midwest Stem Cell Therapy Center (which conducts is research using only adult stem cells). LawsuitPool…well, didn’t. Last Friday, ESPN unveiled their new derived statistic: the Total Quarterback Rating, or QBR. You know, because TQR was already taken? The Big Lead has got some good thoughts on the new stat. It could be useful, but it sounds like there’s still a measure of subjectivity in its “clutch factor” and how it distributes teammate responsibility for a successful play. We’ll see how effective it is as the season progresses. So, in the past three weeks it’s been: Rebecca Black, My Little Pony, a Cowboys and Aliens strip that is not really about Cowboys and Aliens, random music commentary, and now football. Target audience? What the #%& is that? There is another new bonus comic up in the Subscriber’s Edition. I’m enjoying these single-panel bonuses. The single frame to work in is stretching my humor muscles in ways I’m not used to. Also, since I’m only drawing one image, I can add shading and pay more attention to detail, and indulge in other luxuries not afforded by the slavishly efficient brutality of the grayscale tones that are my custom. Just look at that comic above! Such slavish brutality! It’s a wonder you haven’t died yet. This comic idea comes to you courtesy of Ash Green, of AshGreen.net. 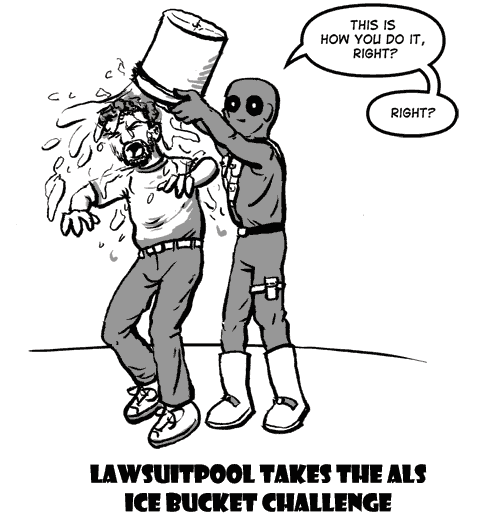 LawsuitPool is a parody of a parody, and his name comes from readers placing bets in a “lawsuit pool” as to how long until Marvel makes me take this strip down. Basically I don’t even write original material anymore. Tune in next week for Prinny Week.